Investec Derby hero Golden Horn stretched his unbeaten record to five with a superb all-the-way victory under Frankie Dettori in the Coral-Eclipse at Sandown. John Gosden's colt was a stunning winner of the premier Classic at Epsom last month and was the 4-9 favourite for his first appearance against his elders. With just five runners going to post, who would make the running was uncertain, but Dettori kept things simple aboard the market leader and after a tardy start, soon allowed him to stride on at the head of affairs. 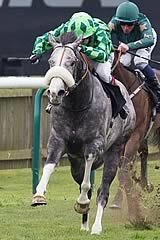 The Grey Gatsby, a dual Group One winner and just touched off in the Prince of Wales's Stakes at Royal Ascot last time, was widely regarded as the biggest threat to his younger opponent and kept at close quarters throughout in the hands of Jamie Spencer. The big two settled down to fight it out in the straight and just for a moment it looked as though The Grey Gatsby might cause a minor upset. However, in receipt of 11lb, Golden Horn began to assert in the final furlong and passed the post three and a half lengths to the good. His stable companion Western Hymn was a long way back in third. Dettori said: "I was in front and Jamie was very clever and attacked me early. He eyeballed me and this horse showed what a true champion he is. He showed a lot of guts to get the win in the end." Winning owner-breeder Anthony Oppenheimer said: "I was always worried with The Grey Gatsby there and they were fighting it out towards the end. "Then, suddenly, this horse found another gear and just took off. Frankie says we haven't got to the bottom of him yet, so we shall see. It's very exciting, very exciting indeed. 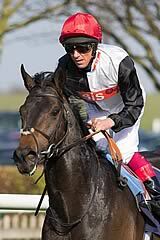 "I think the horse will tell us (where to run next), and John Gosden. We don't know how much it's taking out of him, we'll see weight-wise. It seems as though he didn't have too hard a race, although it looked hard." The King George VI And Queen Elizabeth Stakes at Ascot in three weeks' time is the next possible target for Golden Horn, but connections will not rush a decision on his participation. Gosden said: "I think the moment the draw came out we knew we had to go forward. We hoped someone else would go on and they didn't. "What a lovely clean race, with The Grey Gatsby right there. It was clean all the way, with a top three-year-old and a top older horse. I thought it was a real ding-dong and then in the last furlong he's asserted properly and strongly. He's found three lengths. "He's a very high-class horse. He's won his Derby, he's come here and won the Eclipse. I've got enormous respect for the second and personally I thought it was a purists' race and a great race. "He ran once as a two-year-old, one run in April, one run in May, one run in June and now one in July. The horse will tell me, that's my job - I have to watch and feel and see how he is. "If he's in good form, of course the King George would be wonderful to run in, but if it's a dance too far then we wouldn't. We'll do right by the horse. "He's not in the Arc, so he'd have to be supplemented. I think he'd be an Arc horse unless it went bottomless." Dettori added: "He's been working brilliant and he's a Derby winner getting the weight allowance. We said 'we know he's the best horse, let's prove to the world that he is', so we did it the hard way. "It kind of took him by surprise as he's never been in front. "Jamie Spencer rode a great race and took me on three out and got upsides at the two. My horse had every chance to give in, but he showed what a true champion he is. He wouldn't go down and put some daylight between them at the end. "He's a very laid-back horse, you have to be aggressive with him. In all the races I've rode him in, he never finishes tired. He must have a remarkable physique as he hits the line running every time. "He's a remarkable horse and up there with the very best I've ridden." The Grey Gatsby's trainer Kevin Ryan was thrilled with the performance of his stable star, saying : "It was a great race, which the race deserves to be. "I think we've seen a very exceptional horse - I think we've seen two exceptional horses, for him to concede the weight he has done. "I thought two (furlongs) down we had him, but he (Golden Horn) is a very tough horse and he looked fantastic. There were no hard-luck stories. Both jockeys rode great races. "We're very proud of our horse and I think now we'll just wait for the Juddmonte International. I'd love to take him back to York, our home track. It gives us about six weeks, I think he deserves that now."